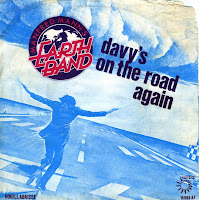 Manfred Mann founded his Earth Band in 1971. Members of the band were Mick Rogers, Noel McCalla, Geoff Dunn and Steve Kinch. Mann wanted to move away from the strict three minute pop song format that was the rule in his previous band, simply called Manfred Mann. Their 1978 album 'Watch' featured the hit single 'Davy's on the road again'. It was the band's last top 10 hit in the UK, peaking at number 6, whereas in the Netherlands it was the band's second and last hit overall, peaking at number 15.